Shopping for a new Mercedes-Benz A Class? When it hits the market, we expect the 2019 Mercedes-Benz A-Class to be the wiser choice over the CLA. Mercedes takes a second aim at an entry-level sedan with the A-Class, and this time hits closer to the mark. The 2019 Mercedes-Benz A-Class splits the brand’s compact sedan lineup in two. The A-Class offers the looks of a more traditional sedan, while the carryover CLA-Class has the swoopier lines of a coupe-like sedan. 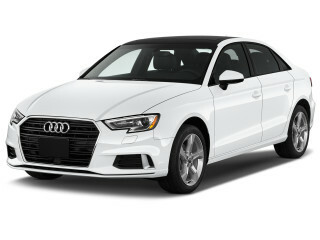 It is offered in just one trim level called A220, though high-performance A35 and A45 models are in the works. Due to hit dealers in late 2018, the 2019 A-Class is offered as just one model, the A220, in front- or all-wheel-drive configurations. Its lone engine is a 2.0-liter turbo-4 rated at 188 horsepower and 221 pound-feet of torque. Power flows to the front or all four wheels via a 7-speed dual-clutch automatic transmission. The EPA hasn’t yet rated the 2019 A-Class, but Mercedes says the slippery shape should help fuel efficiency. The A-Class has a 0.22 coefficient of drag, according to the automaker, among the lowest for a production car. The new A-Class rides an updated version of the architecture that underpins the CLA. Versus the outgoing version of the platform, the new version is lighter, stiffer, and more flexible for future drivetrains. The suspension features MacPherson struts up front with a four-link independent rear axle. Adaptive dampers are optional. The A-Class takes a significant step forward from the CLA in interior technology. With the new Mercedes-Benz User Experience (MBUX) interface, buyers get two screens, one for the instrument cluster and the other for infotainment. They are offered in 7.0- and 10.3-inch sizes. The system recognizes natural speed commands, and the infotainment screen offers touch control, which is a first in a Mercedes. A touchpad is also provided. Apple CarPlay and Android Auto compatibility are standard. Other standard interior goodies include a panoramic sunroof and dual-zone automatic climate control. The options list includes navigation, ambient lighting, multi-countour and heated/cooled front seats, a heated steering wheel, a wireless smartphone charger, a head-up display, and a Burmester sound system. Mercedes says the A-Class has more head room than its competitors, which is a sore spot in the CLA-Class. Safety technology from higher-end Mercedes-Benz cars filters down to the entry-level A-Class. Unfortunately, most of that tech is optional. Among the slew of features are adaptive cruise control, active lane control, forward-collision warnings with automatic emergency braking, forward cross-traffic detection, blind-spot monitors, an automatic lane change function, evasive steering assist, a surround-view camera system, and automatic parking. Mercedes hasn’t said how much the A-Class will cost when it goes on sale soon. The A-Class should be the most affordable among Mercedes’ lineup and could start around $33,000. When the CLA was released in 2013, it started around $30,000, but it is now about $34,000. It may have a traditional sedan silhouette, but the 2019 Mercedes-Benz A-Class is an attractive small car inside and out. The 2019 Mercedes-Benz A-Class isn’t as sleek as its CLA-Class sibling, but it’s an attractive car that still manages to look sporty despite its more traditional sedan shape. The look inside is modern and luxurious. 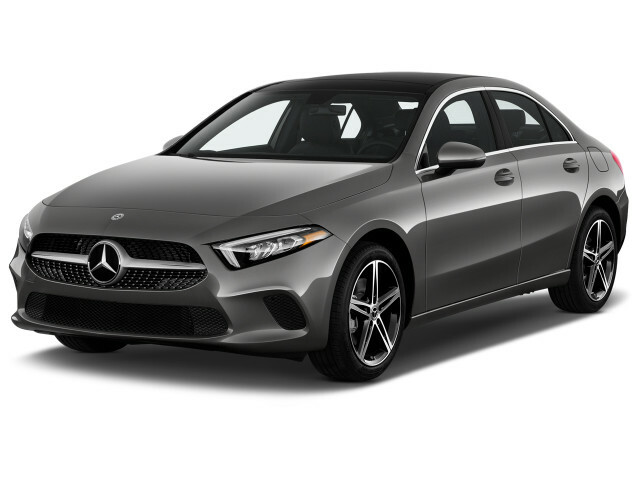 The 2019 Mercedes-Benz A-Class introduces a traditional sedan shape to the bottom of the Mercedes lineup while the CLA becomes a coupe-like sedan, a la the CLS. That doesn’t mean the A-Class isn’t attractive. Its short front and rear overhangs and long hood/short deck proportions give it a sporty stance. Pronounced wheel arches drape over the wheels and tires. They fit especially well over the 19s and further the sporty look. Up front, the hood sits low, the headlights are slim, and the signature Mercedes grille features a large Mercedes star in its center. The grille gets chrome pins with the optional AMG Line Package. 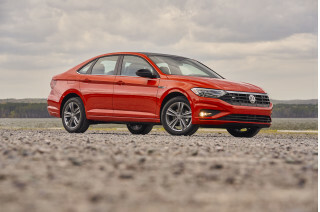 The profile features a sharp shoulder character line, a more subtle line below it that flows off the front wheel arch, and a rising character line near the rocker panel. At the rear, the A-Class has a spoiler shape built into the trunk, two-piece taillights, and dual exhaust outlets. The look inside is modern and premium. A large glass surface, which Mercedes calls the “surfboard,” houses two digital screens that are each either 7.0 or 10.3 inches in size. The screen sits along an inset portion at the top of the dash. Two turbine-shaped air vents sit at either end of the dash and three more are located in the middle; they are absolutely beautiful. The infotainment screens at part of the new Mercedes infotainment system. The central rotary dial control knob from the last system is gone, replaced by a trackpad on the center console as well as a handrest. Small and agile, the 2019 Mercedes-Benz A-Class is fun to drive and its ride is a big improvement over the CLA. The A-Class body structure is an evolution of the CLA but is tuned to be stiffer, which affords better ride quality. Mercedes offers three suspensions and three wheel sizes for the A-Class. The suspensions are conventional, with MacPherson struts up front and a multi-link independent rear end. The AMG Line Package lowers the ride height 0.6 inch without stiffening it. It also comes with 19-inch wheels, though 17s and 18s are available with the base setup. A third choice adds adaptive dampers. Even with the AMG Line Package, the A-Class absorbs most bumps well and doesn’t pound over the smallest stuff like the CLA. The rear end can bound over uneven pavement, but that’s likely due to the short wheelbase more than stiff tuning. The ride almost certainly gets softer with the smaller wheels but we haven’t tested them. The A-Class is fun to drive, too. Its steering has a steady on-center feel, a nice heft, and direct responses. The car leans little in corners and is small enough to change directions quickly. The brakes offer a natural pedal feel, and the perforated front brakes in the AMG Line Package are the best choice for canyon carvers. In its launch year, the A-Class offers only one powertrain, a 2.0-liter turbo-4 that makes 188 hp and 221 lb-ft of torque mated to a 7-speed dual-clutch automatic. Buyers have a choice of front- or all-wheel drive. The turbo-4 is no world-beater, but it will launch the car to 60 mph in 7.1 seconds, which is plenty quick for everyday needs including the occasional highway pass. The engine is matched well to the transmission, too. The 7-speed shifts quickly and decisively, without the pause in power delivery that you can get in the more powerful CLA. Look for performance-oriented A35 and A45 models in the future, with up to 400 horsepower. The cockpit of the A-Class is premium but not quite luxurious, and it has good space for its size. The A-Class’s cabin is a step up from the CLA’s, especially the back seat. Unlike the CLA, head room is plentiful in the back of the A-Class, but that’s partially due to seat bottoms that sit very low and lack thigh support. The rear seat will be fine for shorter trips, but you won’t want to sit back there for hours on end. Rear leg room isn’t as easy to come by. It will work out for a pair of 6-footers front and rear—barely—but intense negotiations about seating position may ensue. The low seat bottoms mean the rear seat can fold flat to make the relatively large 14.8 cubic-foot trunk even more useful. Front-seat passengers have good space on comfortable but not overly supportive seats. The upholstery is vinyl that is glossier and not as richly grained or supple as the fine leathers you can get from other Mercedes models. The dash and door panels also have this material, and the look and feel are premium but not high-end luxury. Some of the other interior components do impress, though. The turbine-look air vents are beautiful and up to S-Class standards, metal trim adorns many of the buttons, and 64 colors of ambient lighting are offered as an option. The 2019 Mercedes-Benz A-Class is available with a wide range of safety features, but most are pricey options. Standard safety features on the 2019 Mercedes-Benz A-Class include the usual set of airbags, plus attention assist, and a rearview camera. A Driver Assistance Package runs $2,250 and adds adaptive cruise control, forward-collision warnings with automatic emergency braking and cross-traffic detection, active lane control, evasive steering assist, active lane change assist, and active blind-spot monitors that will steer the car back into its lane if the driver changes lanes into another car. 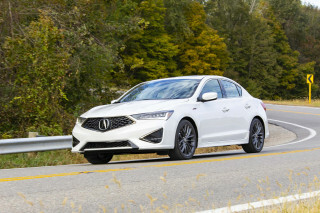 It also slows down for corners when using the navigation system, monitors the speed limit and can set the car to the legal speed, and has Pre-Safe Plus, which prepares the car for a crash if one is imminent. An Exterior Lighting Package brings active high beams and adaptive headlights that point into corners. A Parking Assistance Package adds a surround-view camera system and automatic parking. Standard blind-spot monitors are included in the Premium Package. The 2019 Mercedes-Benz A-Class comes well-equipped at an attractive price and introduces a forward-thinking infotainment system. Mercedes offers the A-Class in one trim level, A220. 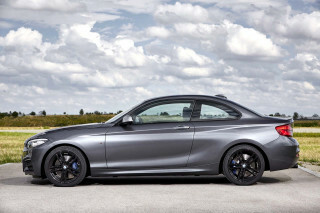 Add all-wheel drive and it’s called the A220 4Matic. Standard features include vinyl upholstery, an eight-way power driver’s seat with memory, split-folding rear seats, dual-zone automatic climate control, keyless access and ignition, the new Mercedes infotainment system with a pair of 7.0-inch screens, Apple CarPlay and Android Auto compatibility, Bluetooth, a panoramic sunroof, LED headlights and taillights, and 18-inch alloy wheels. A Premium Package increases the screen sizes to 10.3 inches, and adds blind-spot monitors, keyless access, auto-dimming rearview and side mirrors, and power-folding side mirrors. An AMG Line Package lowers the suspension 0.6 inch, adds perforated front brake discs, and AMG body styling with a chromed diamond-block grille. Also offered are 19-inch wheels, summer tires, a universal garage door opener, navigation, heated and cooled front seats, satellite radio, ambient lighting, wireless phone charging, and a Burmester sound system. MBUX comes with two 7.0-inch dashboard screens—one for the instrument cluster and the other for the center, and access to the Mercedes Me Connect Services. Mercedes says MBUX uses artificial intelligence to learn the preferences and patterns of the driver, and uses both onboard and cloud-connected data to respond to commands and requests. Drivers can control MBUX through the touchscreen, steering wheel buttons, a trackpad with haptic feedback, and voice commands. The touchscreen swipes quickly to move through functions and the layout is intuitive. The driver need only say “Hey Mercedes” (simply “Mercedes” works, too) and the voice recognition will respond to natural speed patterns—no need to learn the specific commands the system requires. While Mercedes says drivers should think of MBUX as Siri on wheels, we found that it didn’t recognize some questions, perhaps because we were out of range for a good data connection. The navigation system, however, introduces augmented reality that projects a view from a forward-looking camera on the center screen and adds navigation arrows, street names, and addresses when a navigation route is programmed. It works well and is helpful. Expect the A-Class to approach 30 mph combined and be even more efficient than its CLA sibling. 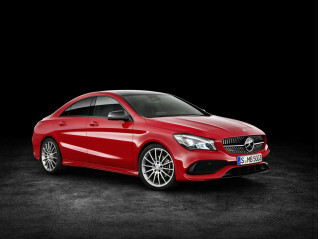 While the CLA uses a 250-hp turbo-4, the A-Class features a 188-hp engine of the same size. With less power, less turbo boost, and a slippery 0.22 coefficient of drag, the A-Class should perform better than the CLA’s EPA ratings. With front-wheel drive, the CLA is rated at 24 mpg city, 37 highway, 29 combined. With all-wheel drive, those numbers fall to 24/32/27 mpg. Expect the A220 and A220 4Matic to beat those numbers by 1-2 mpg. Looking for a different year of the Mercedes-Benz A Class?